"Teachers open the door, but you must enter by yourself..."
A selection of idioms and fixed expressions used in conversational English. Enjoy! This is a great resource I used with my pre-intermediate students. 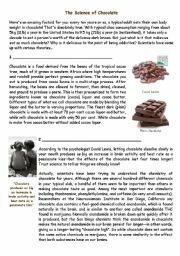 Selected vocabulary to discuss prior to reading or pre-teach to the lower level students included in Science of Chocolate - Part 2 + Comprehension Questions. Enjoy!!! 35 common grammatical mistakes to avoid. 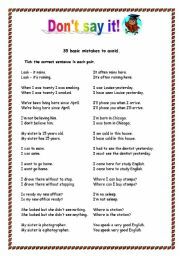 Student choose the correct sentence in each pair. Can be used as a diagnostic test. 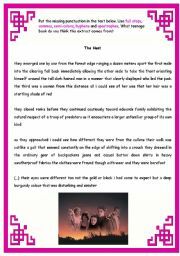 This is a fun punctuation activity based on the well-known teenage vampire novel Twilight by Stephanie Meyer. 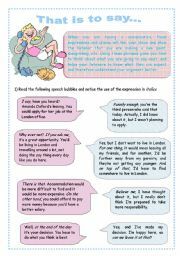 Excellent for checking students´ understanding of basic English grammar. The full answer key included. Enjoy! 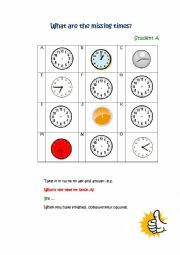 Fun activity for the last lesson before the holiday! 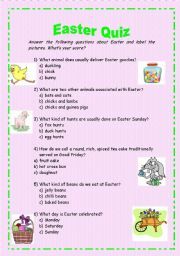 Test your students´ knowledge of the traditions surrounding the celebration of Easter. Get them to label the pictures to practise Easter related vocabulary. Happy Easter everyone! This is a great resource I used with my pre-intermediate students. Selected vocabulary to discuss prior to reading or pre-teach to the lower level students included. 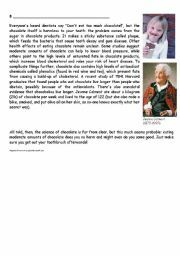 Please see Science of Chocolate - Part 1. Enjoy! 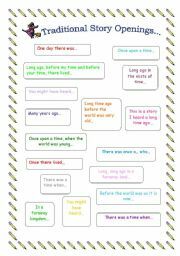 Here is a number of good traditional story openings to use in shared or guided text work. Level: elementary and above. Enjoy! 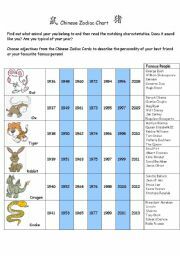 This Chart is to be used with the Chinese Zodiac Signs (Parts 1-3 http://www.eslprintables.com/printable.asp?id=157608#thetop) I uploaded earlier this week. Students can find out which famous people have the same Chinese Zodiac sign as them and describe their personalities. Enjoy!